This article discusses first class functions in Haskell. The concept of First Class Functions is that functions are no different than any other data used in a program. The means that functions can be used both as arguments and well as returned as values from other functions. This is a deceptively powerful feature for a programming language to have. It allows you to abstract out any repetitive computation from your code, and ultimately allows you to write functions that effectively write other functions. Suppose we have a function incEven that takes a number n if it is even increments it, otherwise it returns the number unchanged. While these functions were easy to write all three of them are nearly identical. The only difference is the behavior of incrementing, doubling and squaring. What we have discovered here is a general pattern of computation that we can abstract away. The key thing we need to do this is the ability to pass a function as an argument to perform the desired behavior. Now we can easily handle adding new functions such as ifEvenCube, ifEvenNegate, etc. While named functions are preferred, there are many times were you want to pass in some very simple functionality. Tuples have two very useful functions that are used with them fst and snd, which access the first and second elements of the Tuple. *> fst author > "Will" *> snd author > "Kurt"
Not bad given Haskell has no idea what we’re trying to do! Unfortunately, we usually don’t want to sort by first name. To solve this, we can use Haskell’s sortBy function, which is included in the Data.List module. We need to supply sortBy with another function that will compare two of our Tuple names. Once we explain how to compare two elements then the rest is taken care of. For this we’ll write a function compareLastNames. This function will take two arguments, name1 and name2, and will return GT, LT or EQ. GT, LT and EQ are special types representing “Greater Than”, “Less Than” and “Equal”. In many programming languages we would just return True or False, or 1,-1 and 0. Spot quiz: In compareLastNames we forgot to handle the case where two last names are the same but the first names are different, write a function to compare first names as use it to fix compareLastNames. We’ve talked a fair bit about passing functions as arguments, but this is only half of what it means to have first class functions as values. Functions also return values, and so for truly first class functions it makes sense that functions must sometimes return other functions. As always the question should be “why would I ever want to return a function?” One very good reason is that we want to dispatch certain functions based on other parameters. We need to build a function that will take a name Tuple, like we used before in our sorting example, and an office location and then puts together the mailing address for us. A first pass at this function might look like this. The only other thing we need to introduce that we haven’t seen yet is the ++ operator used to concatenate strings (and lists). *> addressLetter ("Bob","Smith") "PO Box 1234 - San Francisco, CA, 94111" > "Bob Smith - PO Box 1234 - San Francisco, CA, 94111"
This is a fine solution, we could easily just use variables to keep track of the addresses and that would make use much less likely to have errors (and save us typing). We’re all set to send out our newsletters! New York wants the name followed by an “:” rather than a “-“, for mystical reasons they won’t share. Reno wants only last names to be used for greater secrecy. *> addressLetter ("Bob","Smith") "ny" > "Bob Smith: PO Box 789 - New York, NY, 10013"   *> addressLetter ("Bob","Jones") "ny" > "Bob Jones: PO Box 789 - New York, NY, 10013"   *> addressLetter ("Samantha","Smith") "sf" > "Samantha Smith - PO Box 1010 - San Francisco, CA, 94109"   *> addressLetter ("Bob","Smith") "reno" > "Smith - PO Box 456 - Reno, NV 89523"   *> addressLetter ("Bob","Smith") "la" > "Bob Smith"
Now that we’ve separated each of the functions needed for generating addresses we can easily add new rules as they come in from each office. In this example returning functions as values helped us tremendously to make our code easier to understand and extend. This is a pretty simple use of returning functions as values; all we have done is automated how functions can move around. 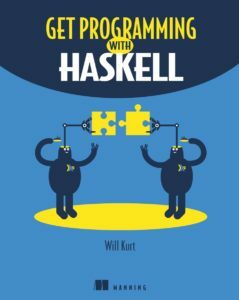 For anything that can be compared in Haskell, for example [Char]which we use for the actual names in our name Tuples, can be compared with a function called compare. The compare function returns either GT, LT or EQ. Rewrite compareLastNames using compare. Answer: Functions can be used as arguments to other functions. This is frequently done to abstract out computation. Functions can also be returned as values from other functions, both to dispatch function based on input as to create new functions. If you’re interested in more, check out the book on liveBook here and see this slide deck.